Disclaimer: All views expressed below are mine and based on my own experiences. These are just my thoughts and I advise everyone to come to their own conclusions and research every tipster they come across. One good thing about the internet is that it is now very hard to get away with being a dodgy tipster. If you claim something that isn’t true, it is there for all to see (unless you delete it). Paying members are quick to point out fake results and dodgy record keeping. But when you post your concerns on their blog, forum, or facebook walls, they own control of that content and can easily delete it. There are not many places to complain and make sure others hear about it. I am working on such a thing as we speak. A place that will keep track of every tipster service and people’s reviews of them (Good and bad). I have built up this site over 4 years and google understands that this is an authority site. Any articles I write about a certain tipster will leap onto the front page in days. It’s about time that any fraudulent tipping services do not last long. Today we have a service that has a real chance to come clean, change direction and run a fair service. If not it will be the first service put on the dreaded DODGY TIPSTERS list. These guys get their own page on my site and a nice trophy sent out to them. The page will also helpfully come up on Google if anyone searches for them. We are talking about two services here. The Trail Files and Horse Racing Genius (part of the Genius Group). Note: A big thank you to Matt who brought this to my attention and did a lot of the research for me. I came across this service back in July. When I said I was moving into following Horse racing tipsters, a reader alerted me to the service. They say they have been running for 18 months now. I joined their free email list and did a bit of research but could not find much data. I emailed the owner and asked basic questions such as what the odds were recorded at, when to place bets, so on. He replied quickly and nothing seemed amiss. He did say. My assumption was they were looking to become media partners with sites like Betfair, or horse racing specific media organisations. I could also see they would eventually move into a paid tipping service. Now there is nothing at all wrong with this. This is the way most tipping services have to operate these days. It’s a simple formula. Give tips away for a year, build a following and track record and then start charging. If this is done correctly and honestly then it’s a great way to build up a tipping business. I decided to give the service a try. After 4 days I was quick to drop the service. My reasons were simple, I had joined up for a paid service that advised bets in similar races and I was put off by the fact no odds were suggested on the bets. This meant at the end of the day, I had no idea what odds they recorded their winners at and they never put these results up, apart from a graph of the overall results. Lets take a look at that graph. Here is a tip for anyone who is looking into tipsters and thinking about subscribing. Be very wary of a graph like this. Before reading on, have a look at it and see if you can pick out anything that might show it to be less then honest? Take your time, as it’s a valuable lesson and may save you a fortune in the future. You can also compare and contrast it with my profit graph on the top left column. Ok, let’s see if you picked up what I saw. Firstly we see a massive winning streak very early on. In the first 100 bets the graph shows 100 units of profit. 150 units of profit are made over the next 1,300 bets. This is a classic sign of something being amiss. At the start, no one is watching. They have carte blanche to record whatever figures they want. As no one knows about the service, there is no one around to query the results. It instantly gives them a nice looking graph as well and people start following. 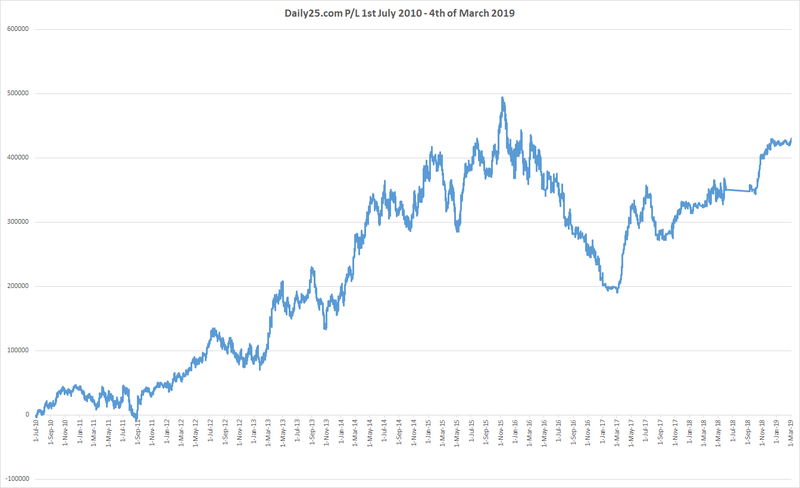 I am not saying that they did not get off to this amazing start (that has not been replicated in the next 1,300 bets), but from the 100’s of other graphs like this I have seen, 99% have been found to be fake. So now they have made all this great profit in a short time and people start talking about them. So we see a more reasonable graph, one that goes from 100 units profit to 260 units in the next 16 months. Off course we don’t know what odds they are recording at. They are without doubt recording at either highest fixed odds at time of release or if the price goes out, the highest Betfair price. So those parts that look like they are breaking even are in fact long losing streaks for followers. If it was possible to get the best odds on every bet we placed, we would all make a fortune from betting. Around the 500 bet mark we see another jump of about 70 units. Anyone betting knows we all go through troughs and peaks and this was a winning run they went on. Anyone just joining the service at this point then raves about it to everyone they know and their followers grow. We can see their current twitter followers now sit at 2,370. This helps them with social proof. If all these people are following this service then it must be legitimate. But people will come and go, follow the service, lose money and leave. But very rarely will they unfollow on Twitter or Facebook. Now, If I was to simply look at the graph, I’d say that yes they may have embellished at the start, and yes they record at the best possible odds (lots do), but they probably would break about even under normal circumstances. Now this was the conclusion I came to many months ago. But it was a free service so I moved on. There are thousands of similar free services over the internet and people are free to follow whoever they want. Then last week I received the email announcing they were moving to a paid only service. They were now teaming up with Horse Racing Genius and becoming a paid service. I had largely forgotten about them and without one very clued up reader sending me an email, this article would never have been written. The email they sent not only explained how well they had done over the past 18 months, it had that lovely graph above in it and then below they listed some of the horses they had advised and recorded as wins over the past. Let’s see which winners they posted. Looks very impressive, doesn’t it. We have a $70 winner there, lots of $20 winners. These guys are the real deal right? umm wrong. This is the point where they did themselves no favors. Everyone received the same email as me and they can’t delete emails. The graph alone was defensible. 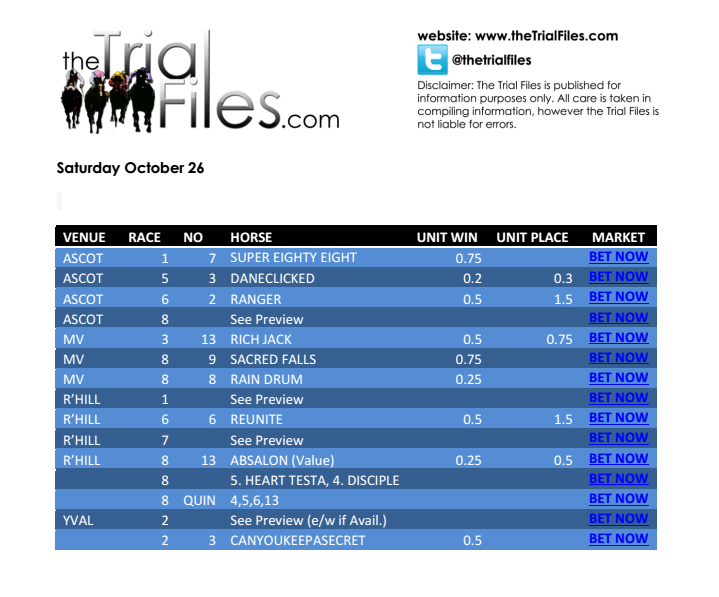 Showing specific winners can be easily verified by looking at the daily pdf’s they sent out. Once again a big thanks to Matt who went through all of these and helped verify the results. I will post snippets of his findings and then his summary. 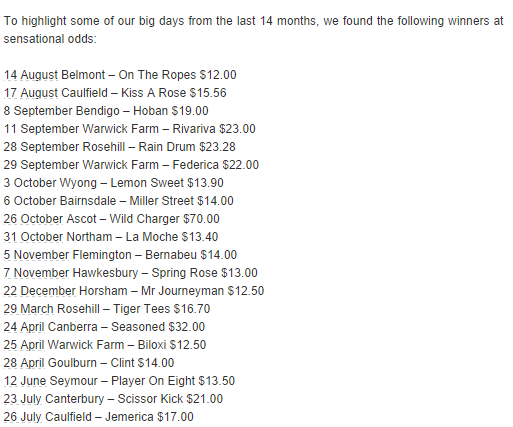 Also was $52 best tote, never hit higher on bookies, don’t know where $70 came from, betfair? So lets see what the PDF file on that day looks like. The race in question is Ascot Race 8. We see no suggested bets, only to look at the preview. The preview does indeed mention the horse, but also mentions 5 other horses and no bets are suggested. Matt has sent me every PDF file showing no official bets (I would say an official bet has to show a unit size like the ones above.). 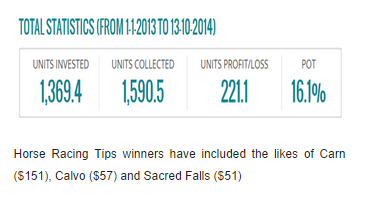 Only 3 of the 13 winners “claimed” were actually suggested as actual bets with units provided. What more can I say about these guys, there is insurmountable proof that they have claimed winners that they never advised. Their results are clearly falsified and the worst part about it they have teamed up with an even bigger site and are now taking money from unsuspecting punters. Not only will these punters lose money following these tips, but they will be paying them for the privilege. These guys are huge. The have their own offices in Melbourne and are (I’m told) raking in millions from subscribers. I read about them when they started and thought nothing of them again. Until now. They have over 800,000 followers on Facebook across all their products and over 27,000 for the Horse racing genius. What is surprising is their twitter followers. They sit at a whopping 21 for Horse racing genius. Facebook is a much easier medium to control, as if anyone writes any negative reviews about you on your wall, you can just delete them. Twitter is a little harder. It seems weird to see a discrepancy like this. It could be simply because they decided Facebook was the place they wanted to be. These guys are great marketers. They clearly come from the same start up space as me, do all the tests that need to be done to improve conversion rates and get new customers. If you’re starting your own tipping site then it would be a good exercise to visit their sites and see how they do it. Now it could have easily been a case that they took what the trial files team gave them in regards to records at face value. They maybe assumed they were on the straight and narrow and there was no need to verify the results. I would assume if you were going to partner with someone then you would look at basic things like record keeping at least. We will never know for sure if they knew in advance or not. What we do know is their reply once Matt brought it to their attention. I’d like to let you know that we are taking your email very seriously, and we will be removing previous Trial Files results from our website as early as tomorrow pending an investigation in to your claims. Now this is a good first step. I can no longer see the results that were claimed on their website. But they still seem happy to continue working with them. The damage has been done though. I’m not sure of the numbers, but would imagine a few hundred people have signed up off the back of those results. Purely for integrity, The Genius group need to email everyone who joined the service and let them know the records were falsified and not a true account of the service. They need to offer a full refund for the service and also place a disclaimer on their site in case any new visitors come based on the false information. Sadly it seems they have not told the Trial files guys about this stance as I just received an email once again advertising their product and quoting the results that Horse Racing Genius has now taken off their site. EDIT: I made a mistake here and believed these results were being claimed to be by the Trial files, these were actually the HRG results that can be verified on their site. This was a wrong assumption by me. I will assume that the Genius team simplly did not do the necessary due diligence when working on this partnership. So while their business practices might not be the best, there probably has been no wrong doing on their part. Until today. Yes folks, it continues….. If what happened on their very first tip is anything to go by then both parties seem content to continue recording misleading results. The tip was a Box Quinella on three horses at 0.5 units. Now every single tipping service I follow (and I follow a few) recommend bets like this. A box Quinella is simple, You select the horses all together and bet whatever unit stake was advised. The bookmaker then splits these up into 3 separate bets (or more if you select more horses). 0.166* units is then bet on the following 3 selections to result in a total stake of 0.5 units. When you explicitly say BOX, that is what is meant. Now let us see the advised bet and the results they recorded at. 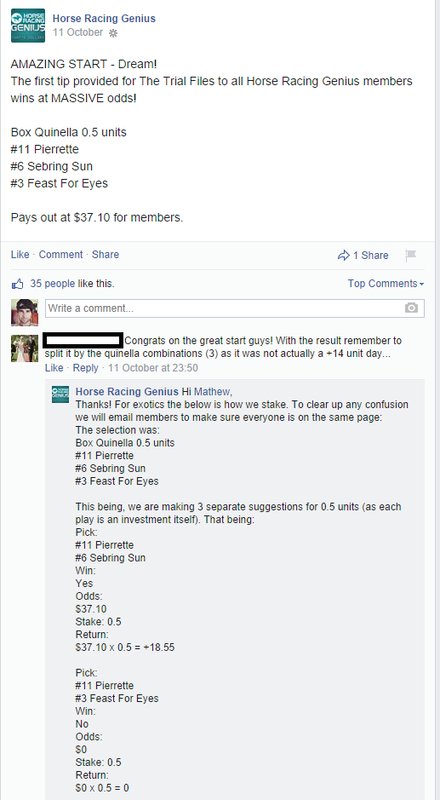 The amusing thing here is that a member had to explain to them how a boxed quinella really works and show that the 18 units they have recorded as a win should actually only be a 6 unit win. Instead of simply saying they messed up, after the fact they decided to say the way they record is to make 3 separate selections yourself. So do not BOX them. It’s clear they are changing the rules after the win and had never explained this to members beforehand. They need to regrade this bet at the real profit, and if they do decide to continue their very strange staking, then that has to be spelled out to members and explained on the site. When I look into a tipster there are many things I look for before deciding to follow them. These guys fail almost every single test. There are hundreds of Horse racing services out there, why would you spend your money on one that has clearly lied? I am happy to post a full reply from the Horse Racing Genius team to clear up any of the issues mentioned in this post. So why did I spend the last 7 hours researching, writing and editing this post. Because I am getting pretty damn sick of people taking advantage of punters. While I also agree it is up to each person to do their own research before spending their money, it makes it much harder for them to do research and come up with the correct conclusion if there is only falsified information to look at. The investment industry is probably the closest thing we can compare the tipster industry to. In the tipping world these lies are simply seen as the norm. If anything went on like this (anymore) in the financial planning industry for example, people would end up in jail. In future articles I will show the tactics dodgy tipsters use to build up a customer base, social proofing, misleading results and so much more. Hopefully once you know what to look for you will be able to spot these guys a mile off. Come out with a statement about the falsified results and link to that statement with a disclaimer on any page referencing the trial files service. Explain in detail their odds recording policy. Great post Steve and very timely. I’ve been receiving the daily write ups for months as they’re free and was very interested to see a detailed record of results as they transformed to a paid service. However as you noted it was interesting when we only saw a graph. I think it’s fair to say that any tipping service that doesn’t produce daily excel spreadsheets of results with a standardized method of how they got their odds needs to be seriously questioned. I believe there should be a site for all Horse racing tipsters to proof their picks. They can choose to record at best fixed odds at time of release, or BOB,TF or Best starting price. They can even choose to average in. They would then get a stamp of approval and people could come to the site and trust the results. Any site that wouldn’t use the service would have to be heavily scrutinised by punters. There’s a huge business there for someone and if they want to create it, I’d be happy to help. Tom (Owner of Trial Files) actually worked for WePunt Racing prior to starting Trial Files, he never tipped but he used them to get his name in the game. He is a unique individual and used many people to build up his service and then burn’t them. He has been called out on his Trial services many times and doesn’t have a record, never provided unit plays until about 6 months ago. At first they used Betfair to fund there project but now are going paid. I wouldn’t take to them on twitter as they have an army of mates that will troll you until you just give up questioning the service. Well written article and great to see someone putting these lists out there. I’m used to the trolling. The facts are there for all to see. If you have a website or post in forums, just link to this article and it will climb the google ranks even quicker. Then it is up to the individuals to at least do a google search on whatever service they are thinking of joining. Good point, as you saw on Saturday some people are very opinionated on twitter. When I started on twitter it was every one helping everyone and offering advice or knowledge. These days in the racing game all it is, is people wanting to cut you down. Like the site and what you have going on Steve. Keep up the good work. Cheers mate, I know how it felt to be a clueless punter and was ripped off by many tipsters. Just trying to share what I have learnt over the years to hopefully save others. Agree with the smart marketing. Can’t fault that. The make money the same way the bookies do, hooking in the people who have no real idea. Hard to educate people though. I work in both industries, tipping and horse racing. There are so many variables that you need to factor in to get all the information but all that can change if a horse misses the kick or jockey has brain fade. 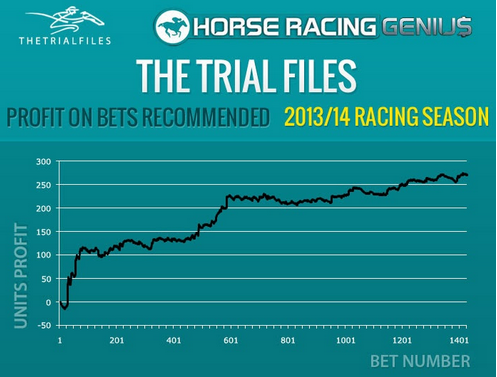 It is hard to make long term gains in racing but the amount of people that bet on it warrants professional tipsters. Lay betting is a probably the best chance you have to making money. Looking forward to the NBA season? Yeah, still the current most wagered sport here. That will change in the next few years. You would think with so many mug punters, there will be value somewhere. NBA usually starts well for me, hopefully the same this season. I believe Jonno is moving to a player based model. So far all the player based models have performed well. Need some wins to get me back into profit for the year. The Great Tip Off and punters.com.au already have a similar transparency model to this. But I don’t think either has the market pull to be considered categorical across the entire industry. For the record, I have been receiving Trial Files for over 14 months now and find the service very educational. However, I typically don’t follow the unit plays so cannot vouch for the accuracy of their record keeping. To me, this just looks more like a case of being sloppy rather than sinister. I hope this can be resolved amicably for all concerned. Thanks for your work on articles like this Steve, much appreciated. As a Sportpunter client myself I’m looking for other tipping services to broaden the portfolio with and a heads-up on what sort of behaviour I should be avoiding is a big help. I must say the “boxed quinella” talk made me laugh out loud, if a tipping service cannot get their terminology right then I’d be avoiding it at all costs. It’s hard to find any others isn’t it. Becomes very frustrating too. Hi guys, apologies for the lengthy response, but as a long term subscriber to MVP Genius services I feel I’m in a pretty good place to offer an opinion. I’ve been with MVP Genius for almost 2 years (basically since they started as a paid service) and can say that for the duration of their service they are profitable, legitimate and records are accurate on their website. They do one thing that I don’t like though which is use specials/promos and record these wins and Units, which is fine for most of their subsrcibers who are only betting in $25 units, but if you’re a bigger punter than that, it doesn’t stack up. They’ve had a losing year this year, which is far outweighed by last years positive results. I believe they are best suited to punters who bet in less than about $70/stake. In the last 2 years, they’re now up to their 3rd “tipster/s” for their Horse Racing Genius product. The first horse racing tipster, is known as ‘The Horse Man’ from memory, and after a period he left and started doing tips for Betjam aka Betscam (which would ring alarm bells for many in the game). I don’t have the stats in front of me, but he was profitable. The second tipster they had is Dean ‘The Trial Spy’. He is highly regarded in the industry and I can testify that his results were long-term profitable. In terms of record keeping, I believe they/he would record the fixed price at the time the email was sent (which for the most part, were sent in PLENTY of time before the start of events, as are MVP Genius’s for that matter). Dean was with them for over 18 months I think. About 5-6 weeks ago, Dean The Trial Spy left and started up another service. Although he has a few service out there with Champion Picks and another of his own I believe. He also regularly has podcasts and interviews for Sports 927am. I know little about Trial Files other than the fact I have been receiving their tips for 5-6 weeks (since Dean Trial Spy left) as a part of my original Horse Racing Genius subscription. During this time they have been profitable, granted this is only a small sample size. Agreed Tom, that quinella tip staking seems intentionally misleading. Always good to hear a current users views. The only issue I had with the Genius group so far is the recording of the BOX quinella. As mentioned in the post, I don’t think they did anything wrong apart from maybe not doing due diligence. The only issues is with the recording of odds and claiming of winners. We will have a reply from the guys soon. Andy, I’ve been with them for 2 years, not sure how much earlier you want their tips sent out? Vast majority emailed out over 12 hours before the event. The only tips that contradict this have been over/under totals being sent out 2 hours before start of match and very occasionally horse racing being sent out 20-30 minutes before a race, but that is explainable when someone is taking in to account track biases. Agreed, the recording of the box quinella appears to me to be intentionally misleading, and I plan on bringing this up with them. Great article, by the way, Steve. Has touched upon some genuine concerns I had (still have) about The Trial File guys when they took over doing MVP Genius’s Horse Racing product. Hey Steve, you’re a massive proponent of sportpunter. I’m guessing the odds SP record are the odds present at the time the tips are uploaded to their site? As frustrating as the lack of market liquidity is for most punters (and genuine tipping services), I don’t blame a horse racing tipsters site using bet365 best odds (best of fixed price at the time/best of totes). Which I think is what Genius Horse Racing have used to record results in the past. I would sincerely doubt it is possible for any long-term profitable tipping service to be run so well as to allow all their subscribers to be able to completely replicate their results. Although, from what I’ve read about your beginners service, you record lines/prices at lowest/worst available? If this is the case, it is very commendable on your behalf, and I would think a rarity (if not completely unique) from my experiences and research with tipping services. I believe he only takes Pinnacle prices before he uploads. So if you have more bookies you can usually get better. BUT, with so many professionals using the service, they get crunched very quickly. The issue with Bet365 best odds product is that it is taken away from any winning punter pretty quickly. But I agree, I have no issue with them recording at those prices. If they really wanted to be fair, they simply just need to record at best tote price. Most bookies offer that feature. Issue is then not many tipsters would show a profit and with no profit showing, there wont be many customers. My tipping service is different, I help users take advantage of all those offers bookies give, these odds don’t change (apart from the lay side). The SP part of my service recorded odds/lines (and would always take the lowest) 2 hours after release for AFL,NRL, and S15. 4. Show that the service, even when recording the worst possible line and odds will still make a great profit. I can’t sit here and blast tipsters and then do the exact same things they do. I really only started my service to show that it is possible to run a profitable, inexpensive service that punters will love and make long term profits from. The same issue people have with tipsters using ‘bet365 best’ could be said about sportpunter’s recordings. I’ve only just started using SP NBL, and although I’ve only seen it in practice for over one weekend, none of those quoted prices are achievable. I’m online the very second they’ve been released, and as you say, they just get crunched so hard, making it impossible to replicate the same level of profitability SP’s records demonstrate. I understand that SP may be the best tipping site going around, but if you can’t replicate these results, an argument can be made that these recording are misleading, just the same as you say the problem using them with ‘bet365 best’ odds are quickly taken away from any winning punter. In the case of MVP Genius SPORTS packages their subscribers are small time punters. When I queried their use of counting promo’s towards their stake P/L as I believed it to be misleading, they told me that most of their customers bet $25/unit. However, their P/L record is far more achievable for THEIR punters then what sportspunter appear to be. Luke, how many books did you have open? I easily beat the lines. Wish I hadn’t as that meant the stakes were increased and I lost a heap. You need to have every Australian book open (all 15-20) & some american facing ones (pin, 5dimes, so on) and to me it seemed like the odds didn’t move as much as last season. SP is damn hard work and not for the normal punter that’s for sure. As I mentioned, I had no issue with recording at B365 best. But everyone knows that it is pretty hard to hold onto this product for any winning punter. I don’t think you can even compare SP to MVP, there is no match. I can see you want to defend MVP, but attacking SP is not a good way, as many members will happily tell you of their ongoing (over 10 years) success with the service and their ability to match and beat prices. Woah, Steve, slow down, I’m definitely not attacking SP, my apologies if it sounded like that, did you miss the part where I said SP might be the best tipping service going around? SP’s track record is impeccable. Awesome to hear that their recorded prices are regularly beatable – as I’ve only been with them a week I’m very happy to hear that! I look forward to the NBL year ahead. On the weekend for the NBL, I had 10 Australian books open (sportsbet, lux, ladbrokes group will no longer have me) and Pinnacle. SP had 13 bets (across H2H, handicap, total) from memory? I got a better spread by 0.5-1 point on 3 occassions which is great. With the 10 other bets, only one of the H2H’s I could get the same price, with the totals I was unable to get the same odds/line. Sorry Luke, my response must have come off wrong as well. I was just saying its hard to gauge a service over 1 weekend(that’s why I have given the genius guys and trial files team a chance to fix it). That was the main reason for the post. I don’t bet the H2H so maybe there are issues there. Betezy had decent lines and seem to be taking bets this season. I would say have them open as well. Palmerbet take very small stakes but sometimes have a good line. The new spreadsheet should make things quicker and easier too. Agreed, ridiculous to gauge from one weekend. Really pleased to hear SP’s prices are achievable/beatable. Looking forward to hearing what response you get from MVP Genius, I’ve found them to be quite reasonable in the past. The Trial Files on the other hand, I’m not so sure about, a number of practices are making me feel a little uneasy and there’s a few alarm bells ringing for me. I hope I’m wrong, as I have a Horse Racing Genius subscription which I believe they now do the tips for. I will allow them to post their response on my site, and also post my views on it. Just curious, in the emails you’ve been getting for months from them, have they always included stake suggestions for each selection? I’d say they would have advised the staking on the majority of selections Luke. I believe sometimes they did advise later via twitter and that was clearly outlined. Some of the horses listed appeared to be for preview purposes only as they had trialled recently. The only thing they didn’t really advise staking on were the exotics. I always enjoyed the write ups and saw it more as a preview service than a pure tipping service. Great analysis. I, like others, really enjoyed TF’s write-ups and they were incredibly knowledgeable. I always considered their actual selections to be odd. I basically never bet their ‘recommendations’, nonetheless I found it slightly cunning that they’d celebrate a win on Twitter yet only mention a horse in the write-up as a ‘decent chance’ etc when I’d go back to verify. On Monday night this struck me as being very odd: Horse Racing Genius had all Trial Files’ ‘results’ on their page, a page which is very good. Through this results page, Trial Files claimed huge results in 2013. However, when I went through the results individually, due to stakes usually being very small (often 0.2 – 0.5 units), their actual results were nothing like they were documented. In other words, during the Spring Carnival months in 2013, they may have been successful but never got near the ~ 50 or 60 units each month they propagated. When I went back about 36 hours ago to individually collate the ‘said’ bets on the HRG website and compare them to the overall figure they had oddly been removed (now I can see why). From a speculative point of view, the 2014 results looked a lot more realistic, but again, I was never able to collate quantitative evidence. As a bi-product of being involved with Horse Racing Genius, I consequently now receive Trial Spy selections. I’m a relatively experienced punter and I will be betting their selections. The first thing I have noticed with this new partnership is Trial Files staking, perhaps to conform with HRG traditional method, has increased dramatically. I’ll be very keen to let you know of my progress. I’ve been an avid reader of your blog for many years and I’m more than happy to answer any questions relating to service provision by MVP Genius. You are doing a service to punters by applying the blowtorch of accountability. I’m the Group’s contracted head sports modeler, and we provide the group with our main market sides and totals selections in all Australian and North American team sports. I pride myself on the years of effort my group and I have put into data science and sports modelling in particular, and am happy to accept all flames and praises from anywhere and anyone. As a former subscriber to Sportpunter, I wholeheartedly agree that Jon Lowe is the yardstick others strive to follow in the Australian sports advisory realm. But the data mining revolution is happening here and now. Others can (and have) done Master’s Degrees and 1000’s of hours of work in data science, and are looking to make +EV returns in liquid sports markets. If Jon thinks he can maintain a monopoly on legitimate sports betting advice and charge ever increasing amounts while the market waits with bated breath on his AFL releases; well he’s finally got some aggressive competition on his hands that will undercut his subscription price and release time. And ultimately the +EV of his overpriced monopoly. Hi Brett, thanks for saying that yardstick! appreciated! But Ive never had a monopoly…if only! There are plenty of groups that are not in the internet that Ive been competing with since the day I started my website 11 years ago. I agree that data mining and sports modelling is where it’s at. The majority of the tipster I follow all use data modelling, One or two are old school and now use a combination of data and their own thoughts. I’m not saying it can’t be done by others, I’m saying I haven’t seen it matched just yet. I would love to see his service surpassed, as that would mean more competition in the market and more profits for punters. I’ll put it in maths terms, Jonno seems to be the outlier. I’m sure I write more then enough glowing reviews based on the fact we are friends, but I’m pretty sure anybody that has made anyone over $400k (yep, combined all the other tipster I follow have made a loss) would also write the same. I’m not sure aggressive is the right word to use here. I doubt Jonno would be too worried about people undercutting his price or release times either. I yell at him daily to start advertising his service to the world, as with the right marketing he would make millions a year. Instead he is content with his group of supporters and is happy to concentrate on the work of making ever better models. That’s why I teamed up with him on my own service, the model is so good that even after all the pros have backed his selections, there is still so much value in them. My goal is to help the smaller punter get Jonnos expertise at a smaller price, and I will Aggressively compete with other marketing departments to make that happen. At the end of the day for me, it isn’t about ego, Jonno is the best, and I doubt he will be dethroned any time soon. The key goal here is that the punters that follow any tipster make a profit and learn about betting. I wish you all the best with your tipping. That’s not old school, the unification of subjective insight and objective modelling is cutting edge. This falls into the realms of Decision Science/Operations Research, and more specifically, Bayesian reasoning. However I very much doubt that the sports handicappers you follow have ever done these things in a formal sense (probably barring Jon). That’s never going to happen to anyone providing services to Australian sports. We all very well know the Draconian extent the Australian corporate bookmaker goes to in this country to limit +EV bettors. That’s nothing to do with the model ‘being so good’, and everything to do with market efficiency in Austrlian sports markets, and the barriers to market entry put up by corporate sportsbooks in this country. Australian sports (and the AFL especially) is the final frontier of decent liquidity, where +EV investments can be made with only mediocre modelling effort. Take a look at global sports, Jon falters in offering anywhere near the same returns. Admittedly so do I/we. I don’t ever expect to generate anywhere the advantage I can on global sports that I can on Australian sports. The market has been soft here for too long, and that is changing quickly. The smaller punter can get Jon’s expertise for free by checking Pinnacle’s lines by 12pm Friday for AFL sides. AFL totals I wouldn’t bother, as there is no real evidence he can model total scores correctly. Being told you have set the pace in Australian sports modelling is well and truly deserved. I wouldn’t be where I am now without stumbling across and being inspired by your site five years ago. I can’t agree with you there Jon. The small sharps with their simple power ratings models that move the line mid-week for a few hundred dollars in Australian sports is really neither yours or my competition. What they do is really the cost of doing business against the more efficient (but more liquid) posted numbers later in the week. When you release into a liquid (enough) Friday morning market, you have done this alone, and with no public competition (until now). I’ve met people/groups over the years that are well aware of your releases, but they are not your competitors either, as they have no choice but to time market entry at near game time given their liquidity requirements. So in summary, you have had carte blanche for a number of years accommodating a niche of sports bettors that have had bankrolls large enough to exploit a Thursday/Friday release and the liquidity that subset of time prior to the game represents. Let’s agree to disagree in this area Jon. 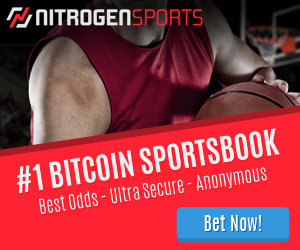 Many of your actual win percentages against binary markets would not beat $1.91/-110 consensus lines on US and global sports (barring NHL sides). You do your results a huge favor by recording the Pinnacle price. I’m trying to get MVP Genius to eventually emulate Right Angle Sports (RAS) in how they record their plays. All graded against the consensus line at release and at -110/$1.91. I think they are the market leader in transparent results reporting, and I want everyone else to move into the same direction. Hi Steve.. how about all these horse racing tipsters who go under the guise of promoting ratings.. tipsters who claim there ratings produce 15-20 % POT whitout much proof. For example like a company called winform .. claims in his daily blog that he rarely looses and its the clients fault for not following rules ect ect… charges good money and preys on the retired and like.. writes plenty of books to back up his theorys .. plenty of tipsters out there like that…hundreds i reckon.. its a mugs game out there. Common question they are all.asked is if your tips work why are you selling them… Answer… the market is so large that it wont effect my bottom line.. but really I make more selling tips than actually betting on my sellections..
Next story Trail Files/Horse Racing Genius Update.